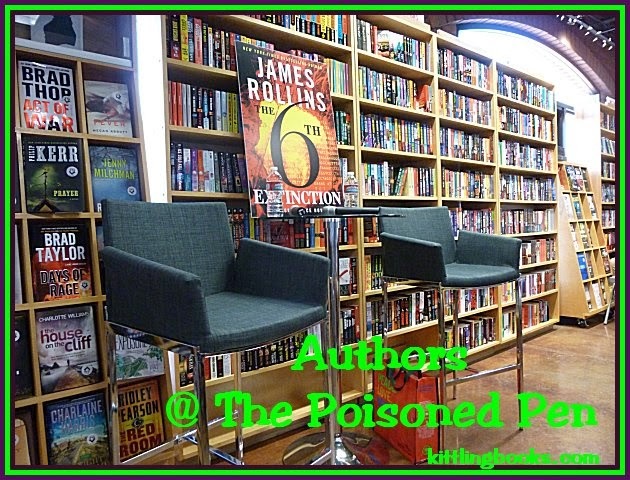 At The Poisoned Pen with Deborah Crombie! 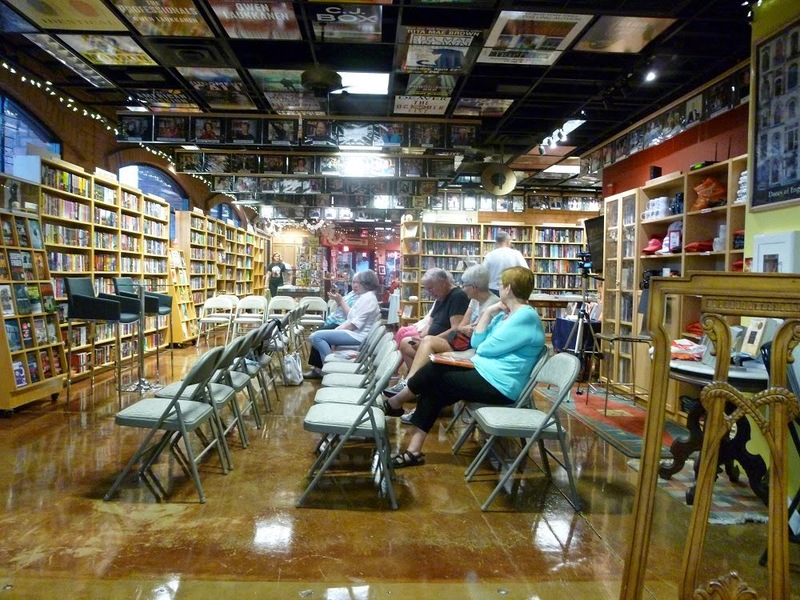 With the rain and flooding in the Phoenix area canceling an author event that we'd planned to attend, it had been a while since Denis and I headed over to our favorite bookstore, The Poisoned Pen, in Scottsdale. With our trip up to Black Canyon Lake on the Mogollon Rim area, we had been refreshed with our sightings of mule deer, golden-mantled squirrels, Stellar's Jays, a Cooper's Hawk, and a Belted Kingfisher, and were more than ready for some culture. I made my usual purchase (this time Weave of Absence by Carol Ann Martin and To Dwell in Darkness by tonight's author Deborah Crombie) and made my way to the back to sit and read. I'd no more stuck my nose into Charlie Lovett's First Impressions when The Poisoned Pen's technical guru, Ariel, asked me if I'd noticed that the bodies were gone. Now, I'd noticed that the floor was so shiny you could count the pores on your face, but I hadn't noticed that those crime-scene-tape yellow "chalk" outlines of two bodies were missing! Seems the company that cleans the floor was so zealous that they polished them right off. I asked Ariel if she was going to lay on the floor to provide the outlines again, and she said she probably would-- but she was thinking of adding blood splatter as well. Sounds good to me! "If you don't send me to The Poisoned Pen..."
Barbara replied, "Publishers seem to wax and wane about how they want to publicize their books. Deborah's just begun a five-week book tour-- and other times she has to offer to pay her own way. You just never know how it's going to work out!" Barbara once interviewed Deborah during a Left Coast Crime conference, which is where she learned she'll never be able to keep one of Crombie's titles straight: "I've never been able to keep the title Leave the Grave Green straight... I've called it Leave the Grass Green forever!" Deborah laughed and said, "My agent calls it Leave the Grass Green, and we refer to it as 'the fertilizer mystery'." Although most of Crombie's books are set in various London locations, she has set a few in other UK areas. For years, Barbara used to campaign for a "pottery" book (one set amongst all the china and pottery factories of Staffordshire), but she told us, "I've decided that I'm going to have to write it myself and put Deborah's name on it." Deborah did say that she'd love to write Barbara's pottery book, but that she wrote herself into a bit of a corner, and now she needs to deal with that first. "It's sort of ticking quietly in the background..."
"It started at the end of No Mark Upon Her where something happened that was not what it appeared to be," Crombie said, "and I knew it wasn't what it appeared to be when I wrote it. I sort of knew what really happened and what the consequences were going to be, and it was something that couldn't be resolved in that book. Then The Sound of Broken Glass... it kind of simmered under the surface a bit, and you get more of it in this book... and then in the next one, I'm going to have to deal with it. I'm not sure exactly what I'm going to do yet!" "I figured you were postponing it because you didn't know what you were going to do," Barbara said, "but I like it. It's sort of ticking quietly in the background, and it could go for a while." "I've had a couple of people ask me after that book came out why I ruined a perfectly good crime novel with an unresolved conspiracy," Crombie went on to say. "I did it because I thought it was interesting. And if you just write the same thing... this is my sixteenth book, and if you just write the same thing all the time you get bored, and readers will get bored. If people want to read the same book, they can reread all the others. I'm being tacky, I know! Of course I want people to love the books I write, but it was just something I wanted to do. " "I agree that if you aren't enthused about what you're writing, readers won't be either," Barbara said, "but I also wondered if Rob and I hadn't been influenced by MHZ TV that you can get through Direct TV. We've been watching these European crime stories that run on for episodes, and believe me they can go on forever---"
"Story arcs!" Deborah blurted out. "Yes," Barbara agreed. "Even Call the Midwife. I know it's not crime fiction, but I absolutely love it. I think I've gotten more accustomed to long-running story lines." 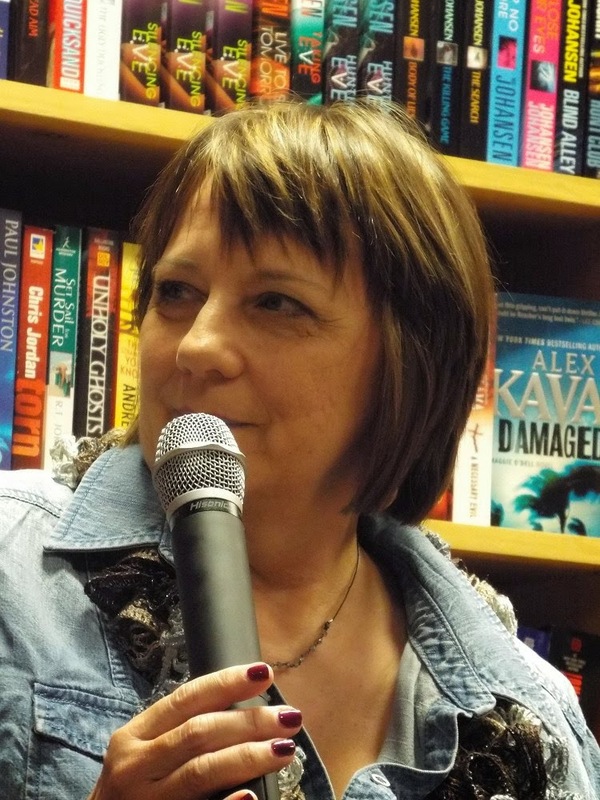 Crombie then mentioned that she'd had various ongoing relationship threads in her books as well as investigations, but she felt that "at least one story line needs to be resolved or the reader feels cheated." 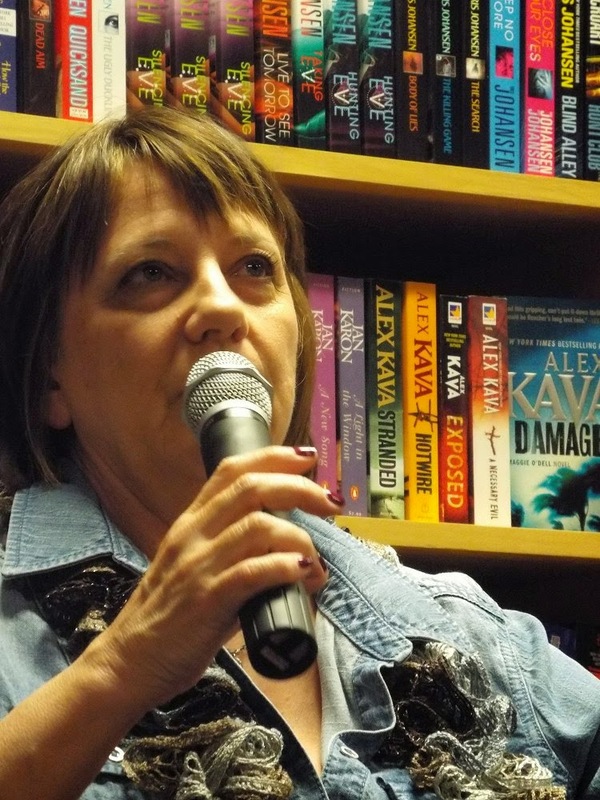 "I'm not a fan of repeat serial killer characters," Barbara added. "I stopped reading Patricia Cornwell when a serial killer had already appeared twice and then came back a third time as a ghost. Just come up with a new serial killer! Why are you recycling the same one?" "...nothing to do with the London Eye!" As talk began to turn to her newest book, To Dwell in Darkness, Deborah assured us that it had "absolutely nothing to do with the London Eye. The London Eye just makes a striking cover!" She described this book to us as a "continuation of my love affair with Victorian architecture." Crombie loves St. Pancras International Railway Station in London, and knew that she would one day set a book there. "I think it's the crowning achievement of Victorian architecture," she told us. "We might want to say a few words about how the train stations in London work," Peters said, "because you can't just take a train from any London station to go anywhere." "Yes, that was the big thing about St. Pancras because it would take the trains coming from the north. Trains coming from the west will go to one station, those from the south to another, and so on. What station you go to in London depends upon which direction you're traveling," Crombie said. From St. Pancras to trains to Crombie's latest book, the author told us that at the beginning of To Dwell in Darkness, Duncan is still trying to make sense of his abrupt transfer from Scotland Yard to an area murder investigation team for the borough of Camden that works out of Holborn Station. He's not getting along well with his team, and he's unaccustomed to being disliked. But all that takes a backseat when a white phosphorus grenade is set off in St. Pancras Station. He and his team have to learn-- and learn quickly-- if this was an accident or an act of terrorism. It's the main case in the book, with Gemma's case taking on a secondary role, which is only right since she had the lead in The Sound of Broken Glass. Crombie did want, however, for something in Gemma's case to give Duncan insight into the identity of the murderer in the investigation he's running. "So I gave Gemma this case, and then I realized I was going to have to solve it. It was hard!" Peters said it sounded as though this book had been difficult to write. "It was really a challenge," Crombie agreed. "It's certainly not the longest book I've ever written. That was Water Like a Stone which was 'the book that wouldn't die'! It was something like 650 pages in manuscript. To Dwell in Darkness was a challenge. Everything happens in four days. It was a very tight timeline. I felt as though I were writing an episode of 24. So everything had to count. There were so many different story lines, so many different characters... and everything had to be blocked together. I hope I pulled everything off." "I think you did," Barbara said. "So... what happens to the kittens?" "Ah, everyone wants to know about the kittens, although when my editor was reading the manuscript, she kept saying, 'Enough of the kittens!' But then I'd tell her 'There's a reason why the kittens are there!'" Crombie went on to tell us more about the kittens, but I'm only going to say that Kit and Toby find a starving mother cat and four kittens and wind up bringing them home. Barbara and Deborah then proceeded to tell us about the time that they had tea at the Ritz and then went to Buckingham Palace when it first opened to the public in order to raise funds for the repairs to Hampton Court Palace, which had had a devastating fire in 1986. After getting sidetracked, Barbara said, "So we had tea at the Ritz and then went to Buckingham Palace and went through it, and even then you were kvetching about being late with a book! I didn't want to say whining. So it's been sort of a constant...."
Deborah laughed and replied, "If you do the math it's been twenty-one years since A Share in Death was published, and I've written sixteen books. So it's not that..."
"I didn't mean that you were chronically late," Barbara rushed in to say. "I meant that you were chronically anxious that you won't get it done and bring it all together." "Yes, and it hasn't gotten any better," Deborah said. "I think you've had an endless quest for perfection and that makes it harder for you," Peters commented. "My agent (we've been together for twenty-three years) has asked me why I can't just write a draft. But it's never worked that way for me. My friend Louise Penny writes a draft, and then she writes another draft. I can't do that. I outline." "Whatever works for you," Peters said. "I have to figure out how all the pieces fit together before I can actually sit down and start writing." To illustrate how much she can agonize over her writing, Crombie then told us that she turned in the manuscript for To Dwell in Darkness on July 1-- which cut it close for all the finishing touches to be done. "I have to turn in my next manuscript on March 1, and how that is going to happen, I do not know! I know what's going to happen in the next book... and that's about it! Now what I need is uninterrupted time where I can lock myself away and just write." Deborah highly recommends Connie Willis's Blackout and All Clear as "the best description of the Blitz I've ever read. Everyone should really read these books!" Barbara then mentioned having her wallet stolen in Covent Garden-- just as she exited the Police Museum. Perhaps the biggest news came at the very end: a British production company has bought the option for Crombie's series in hopes of turning it into a television series for BBC or ITV. One of the stars who has been mentioned is Joe Armstrong, son of Alun Armstrong who will be very familiar to any New Tricks fans out there (like Denis and me). I can't wait to see what happens! After getting my book signed, Denis and I stopped at the Cornish Pasty for dinner, and talked books all the way home. Haven't read Deborah Crombie? You just have to change that-- she is an incredible writer! Cathy - As always, a fabulous PP summing-up. 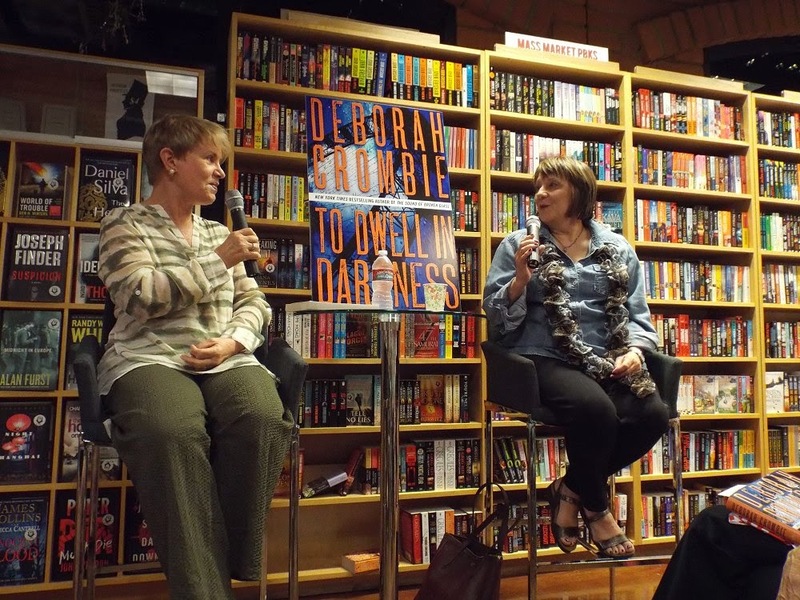 So glad that you got to see Deborah Crombie, too, whose series I like very much. 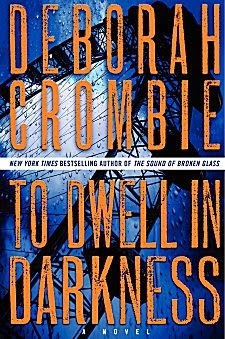 I finished reading To Dwell in Darkness yesterday-- another good'un!